Beautiful colours for artists from beginner to professional. We carry an assortment of Watercolours, Gouache, Acrylics, Oils, and Encaustics, featuring paints from Winsor & Newton, Daniel Smith, Liquitex, Golden, Da Vinci, Encaustikos, Pebeo, and more. 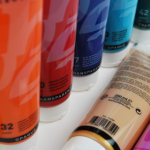 We also carry specialty Fabric, Porcelain, and Glass paints, a wide assortment of Paint Mediums, as well as a range of paint sets to get you started in a new medium. Come discover your new favourite hue!